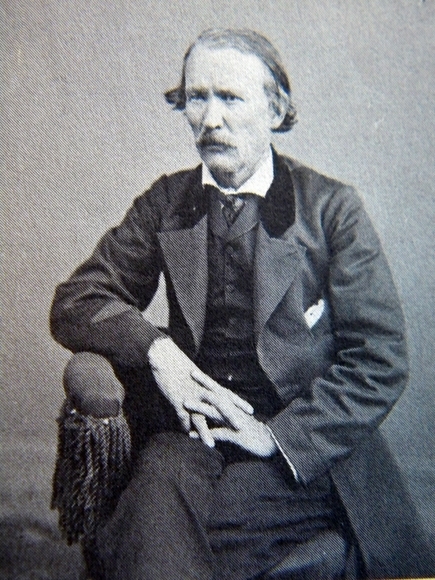 Kit Carson was born in Missouri in 1809. When he was 19 years old, Kit left Missouri and became a scout. He worked throughout the Southwest and California. It was during his expeditions with John C. Fremont that he gained his reputation as an amazing mountaineer and guide. By the 1850's, he found himself in great demand. Then, as a guide for Stephen Watts Kearny, Kit would help the United States military retake Sante Fe. Not long afterward, the U.S. Army commissioned him a colonel. In 1862, the U.S. Army was afraid that the Confederate Army would invade New Mexico by way of Texas. As a direct result, the 1,800 man California Volunteer Brigade was assigned the task of protecting New Mexico against invasion. The brigade was led by Colonel James Carlton, and instead of fighting against the Confederates in the Civil War, they would fight the Apache. Soon after arriving the California Volunteers series of search and destroy missions. Eventually, these missions would lead to the capture of Mangas Colorado. Mangas had been lured into a trap under a flag of truce. He was subsequently tortured and shot while he was still bound. Before long, Colonel Carleton was promoted to brigadier general and placed in charge of the new Department of New Mexico. It was his decision to appoint Kit Carson to lead the California regiment, as well as 5 additional regiments. Carson's first assignment was to force the Mescalero Apaches onto the Bosque Redondo Reservation. He was so successful, that Carleton now assigned him the same task against the Navajo. Carson's first venture into Navajo country would only last a month and resulted in the capture of women and children. The troops had only managed brief skirmishes that left 4 Navajo dead. The U.S. Army lost one officer to sniper fire. For most of the next year the Navajo stayed out of sight. At the same time, Carson had his men destroy their food supply, wiping out most of the corn, and rounding up their livestock. The Navajo quickly retaliated by raiding the Bosque Redondo Reservation and stealing the Mescalero Apaches livestock. Then on January 4, 1864, the Navajo once again raided the reservation. Only this time the Mescalero scouts and the 5th Infantry Regiment were waiting, and this time they gave chase. The result was an all day battle that left 40 Navajo dead. Next, Carleton ordered Carson to sweep the entire Navajo Territory, including the sacred Canyon de Chelly. Canyon de Chelly, with it's sheer 1,000 foot canyon walls was an intimidating sight. On January12, 1864, Carson and his men entered the maze of canyons. The Navajo had taken up took a strategic position high up the canyon walls. The first thing the soldiers did was cut off their supplies. The fighting lasted for 2 days, and when it was over 23 Navajo were dead. The weather was freezing cold, and before long the Navajo began to surrender. During the month of January, 600 surrendered, and more than 1,200 surrendered the following month. In 1864, 8,000 members of the Navajo were relocated on the Bosque Redondo Reservation with the Mescalero Apaches. This march is still remembered as the “Long Walk.” The accommodations didn't work out very well. The Mescalero Apaches and the Navajo had had a history of not getting along. Then in 1868, the United States government returned the Navajo to northeast Arizona, and their beloved Canyon de Chelly.